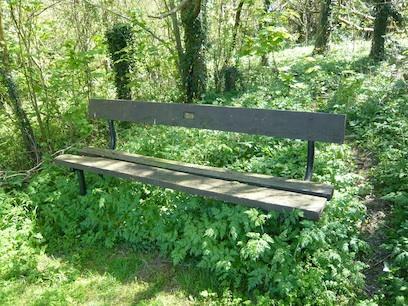 There are plenty of places to take a rest in Selsdon Wood. The map above shows the locations of 43 benches (numbered) 4 of which are dedicated, and 20 dedicated seats with backs (denoted by letters). The dedications are on metal plaques except where "carved" is specified in the list below. Details of the dedicated seats and benches are given below in alphabetical order of the names of those to whom they are dedicated. We would be very interested to know more about those commemorated. Do please get in touch if you knew them. 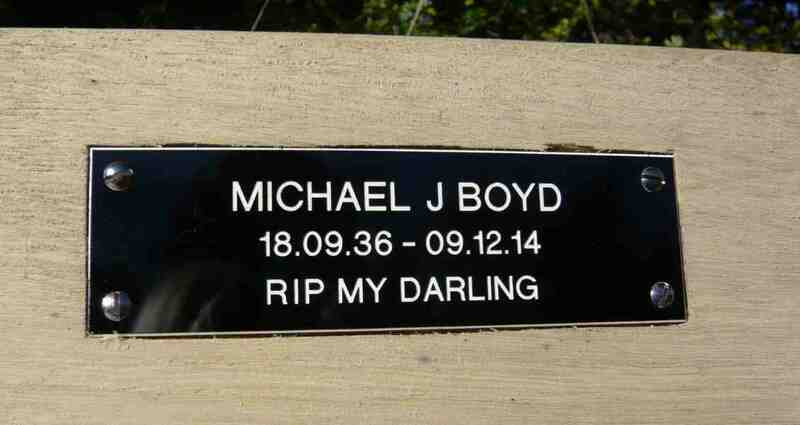 If you are interested in placing a commemorative bench or seat please contact us for further information. 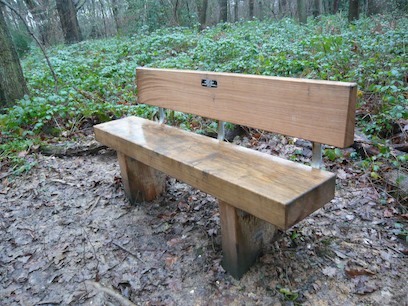 FSW can install seats & benches made by Norbury Park Wood Products (A Surrey Wildlife Trust subsidiary). These are built for security, durability & strength from green oak with 3 feet long legs. 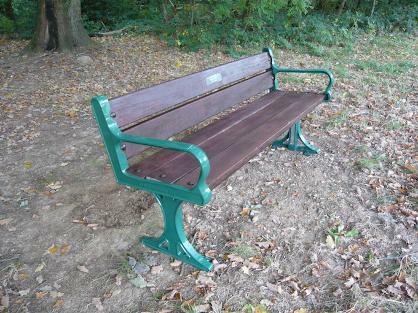 The Friends have installed 13 seats and benches in 5 years. 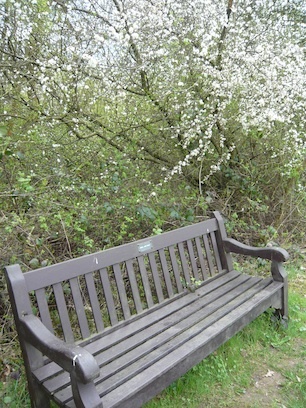 This bench, shown in April backed with Blackthorn blossom, is in the Great Field backing Steven's Walk. We have no biographical details for Nicola. Do please get in touch if you can supply some. The bench dedicated to Janet Bickerstaff is at the junction of Avis Grove and Beech Grove. 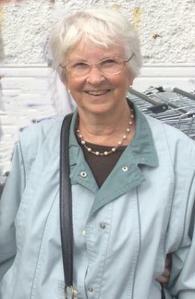 Janet was a founder member of the committee of the FSW and remained active from its inception in 2008 until 2015. The tribute below was written by her husband John Bickerstaff. Born at Epsom, Surrey on the 7th February 1934 to Ethel and Cecil Lightfoot. Educated at the Sutton Public Day School and later at Miss Hoster’s School to learn typing and shorthand. Janet did not enjoy shorthand but loved working with figures, probably because her mother was a book keeper and her father an accountant. She became secretary to the financial director of the John Brown and saw cheques for millions - these being payment for the QE2. Later (40 years) Janet took a cruise on the QE2, travelling as a passenger just before the ship completed 40 years of service and made her last voyage to Dubai to serve as a floating hotel . Janet loved gardening and created one of the most attractive private gardens in Croydon that took some 30 years to complete. It remains a wonderful place to enjoy. For many years she organised holidays for her friends who worked for May and Baker and once her group (7 girls and one man - husband of one of the party) followed John Julius Norwich, who was filming for the BBC, some of the Turkish ruins (including Kusadasi). Another regular M & B event was Thursday nights at the Spaghetti House, near Oxford Street. This was ideal for the girls to buy up bargains before eating. Her work for John Brown meant she travelled to London Victoria by steam train. It was usual in those days to get into the same carriage each day and to get to know fellow travellers. One of these was John (Bickerstaff). The telegraph crossword was worked on as the train chuffed on to London (who held hands under the newspaper!). The friendship became a marriage that took place in Canterbury on the 12th of May 1976 and a change of name to Bickerstaff. 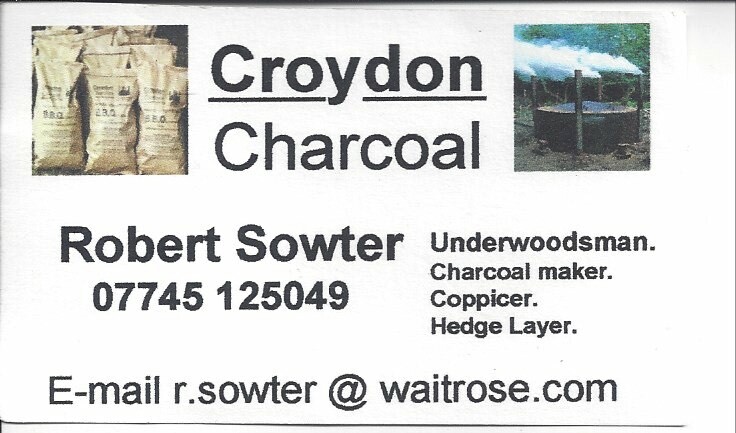 After a change of business workplace for John they moved to Croydon in 1982 living in a bungalow near Selsdon Wood. Soon after this move Janet undertook a Project for the Open University - this was part of their Changing Countryside course. The title was ‘History and Management of Selsdon Woods' (note the Selsdon Wood is owned by the National Trust but managed by the London Borough of Croydon). 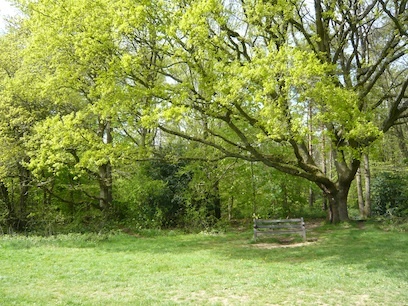 More recently Janet became a member of the Friends of Selsdon Wood - a group formed to do some of the things the Croydon Borough cannot afford to do. Janet was a member of the Selsdon Flower Club and for some years won Certificates of Merit and Diplomas for her flower arrangements . Then she became the clubs’ treasurer. Visits to National Trust gardens and those of the RHS just had to be frequent and the inevitable cream teas. Whilst the personal computer was in its early stage of development Janet and John joined the Independent PET user group whose numbers increased to over 5000. Duties Janet took up for ICPUG included Show Organiser. These shows were mostly held at Earls Court and Olympia. Janet undertook testing of software programmes and wrote regularly for the Amiga User International magazine. Continuing her writing she become co-editor of the 6 issues per year magazine of the local computer club, having been made an honorary member for her years of service. Janet was a member of the Ladies PROBUS Club of Croydon South and John a member of the Mens PROBUS Club of Croydon South where they met and made many friends.. In 2013 she had a (right) knee replacement because of arthritis (Janet believed this was because it was her gardening digging knee). This made walking easier but prevented her from kneeling to do weeding. A gardener for the heavy work was then found to make life easier. 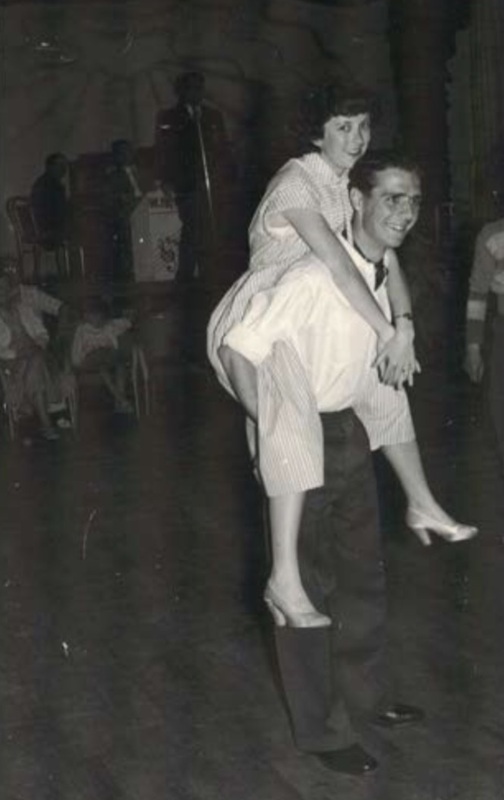 For many years Janet enjoyed overseas holidays which included annual trips to Dallas and touring the southern states with Betty Clay – a friend met whilst working on the show stands for IPUG. Other adventures included a visit to the Canadian Rockies extended to Vancouver Island where her cousin Frank Humphrey resides. Janet will be especially remembered for her smiles, her gardening, her love of Donkeys and her ability to write on any subject. Her proof reading amazed us all. Fly away now but hover for a while. 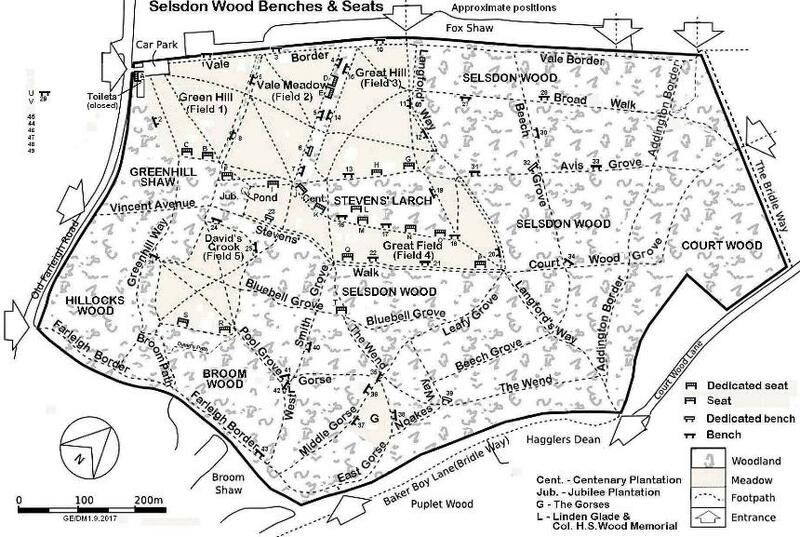 Janet's project on the 'History and Management of Selsdon Woods' may be downloaded from this link. The seat dedicated to the memory of Vera Cannon is at the intersection of The Wend and Bluebell Grove. The photo on the left (taken on Boxing Day 2015) shows her son Harold sitting on the seat with FSW Chair, Heather Govier & Bella. Vera’s journey began a long time ago on a farm in Africa. Her Father, Harold Cooper, was born and brought up in Liverpool where he qualified as an architect at Liverpool University. Vera’s Grandfather had gone to Africa to fight in the South African War and Harold joined him there some time later. There he became attached to Intelligence and befriended the Captain of a train of Ox Wagons which regularly travelled between the Eastern Cape coast and the Interior. At the end of the war Harold returned to Liverpool and looked after his unwell Mother until she passed on, returning to Africa to marry one of seven daughters of the Ox wagon train Captain, descendants of the 1820 British settlers to the Cape. Harold and Ida settled in Johannesburg where Vera and her brother Edgar were born and brought up. Many of her early years were on a farm at Mereton, South of the thriving Gold Reef town. It was a colonial existence with England always regarded as ’home’. Vera loved England so and was captivated on her first visit in 1927 when they toured Great Britain and the continent. They came to stay at an establishment at Farleigh Common run by the Prues who had been in service and on retirement opened their home to paying guests. The family stayed initially at the Prues' whilst they visited relatives living in Purley but liked it so much that they made it their home base during the year, in between tours. It was during their stays there that Vera discovered Selsdon Wood and the beautiful bluebells that she never ever forgot. Vera returned to Johannesburg with the family and worked in a lawyer’s office there. Her first car was a Baby Austin, given to her on the strict condition that she maintain it entirely herself (servicing and all). Vera married a Londoner, Ernest Cannon, in Johannesburg. The whole family moved to the Eastern Cape later where they opened a Filling station and Garage in East London on the busy route to the Transkei. Her son’s earliest years were to be in a basket perched on the Reception desk and many customers would come in especially to peek at developments. 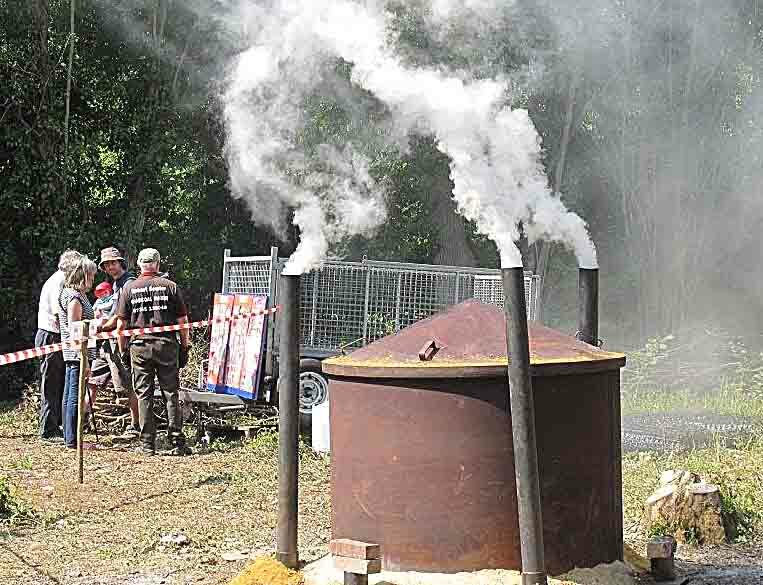 When the business was sold the entire family moved to the country close to the village of Gonubie, North of East London where they were to remain for many years and where her Father died in 1959. Vera returned to England in 1961 with her husband and son, repeating the grand tour of earlier years and revisiting her beautiful Selsdon Wood at bluebell time. A few precious blooms were carried away to be pressed and cherished over the years. In the late 1960’s and early 1970’s Vera’s son Harold moved to London to live and work. There were several visits for Vera and Ernest to the United Kingdom during that time, always involving enjoyed visits to Selsdon Wood and very often in the Spring. Her son moved back to Africa in 1975 and Vera’s husband passed on in East London in 1986. 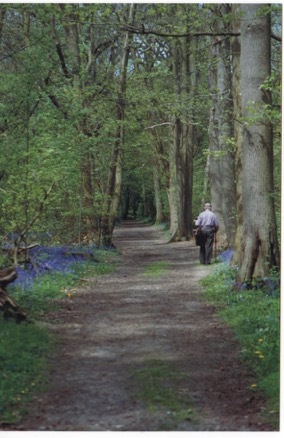 She was never to visit Selsdon Wood again, but always, always spoke of the wonderful Wood she had known since she was a teenager and of the beautiful bluebells that had captivated her imagination over all the years since. Vera forgot many things in her last years but never ever did she forget those bluebells in Selsdon Wood. Vera passed on just 19 days short of her 100th birthday in 2010 in East London. Within a year her son, Harold, had returned to the United Kingdom and her ashes were brought back home to her beloved England then. On the initial leg of the flight the aircraft somehow unusually diverted on an unfamiliar flight path down the Vaal river before turning North again to Johannesburg. How strange we thought, until we realised, we were flying directly over Mereton and the African farm Vera had grown up on as a child. She was saying good bye to Africa for the last time before heading for home. Bluebells fill the forest floor. To cascade over bluebells in the breeze. This gift from nature to me and you. Before the bluebells bow and say goodnight. This bench was installed on the NE side of Field 2 in the spring of 2013 by friends of Heather Creamer after her death the previous December. 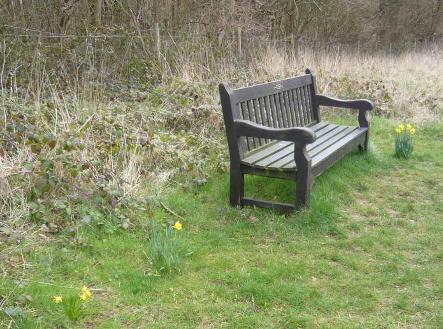 They planted crocuses around the bench as a tribute to her (shown above in March 2015). We know no biographical details for Heather. Do please get in touch if you can supply some. Tribute daffodils have been planted next to this seat and flowers in a jar are often left beside it. 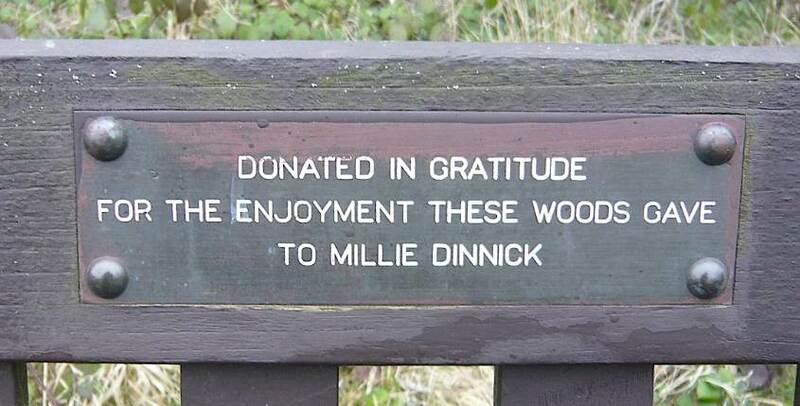 However we know nothing about Millie Dinnick or when her bench was placed there at the top of Field 2 backing the Jubilee Plantation. Do please get in touch if you have any information. 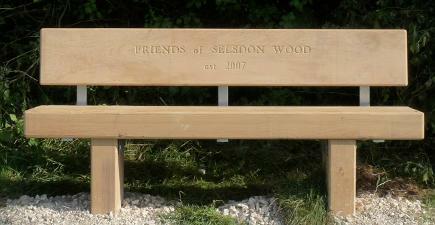 On 7th August 2013 the Friends of Selsdon Wood installed a new seat at the top of Green Hill, donated to commemorate the establishment of the FSW in 2007. 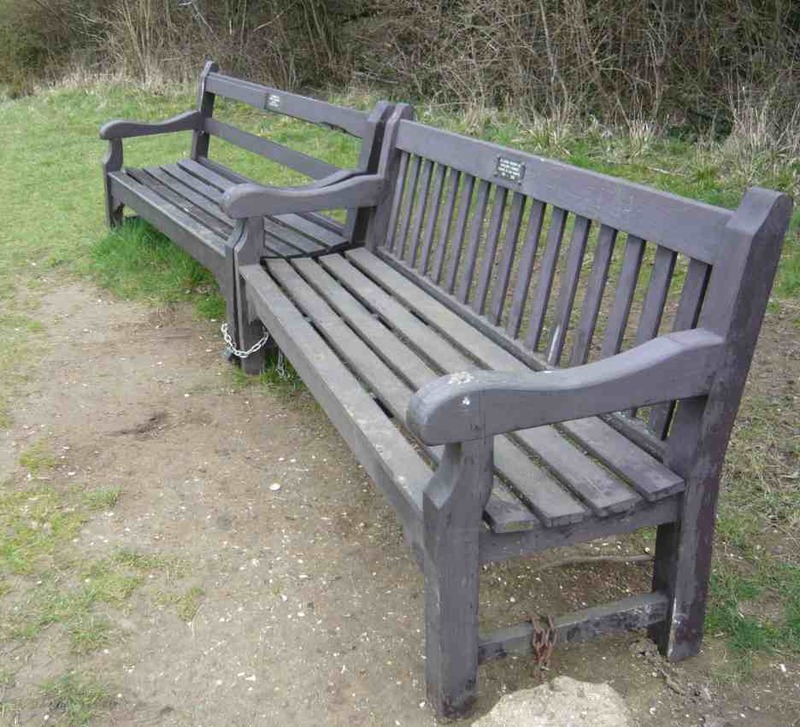 The photo above shows the workers - John, Cyril and David immediately after the installation and the photo to the right shows the bench in spring 2015 after weathering. 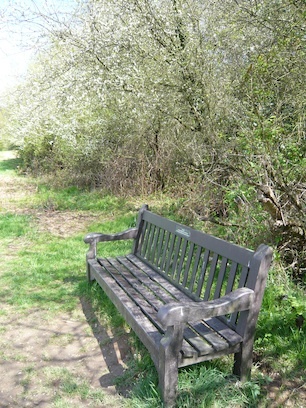 The FSW installed 2 further seats in May 2018 - both in Great Field, one backing Vale Meadow (below left) and the other backing Steven's Larch (below right). 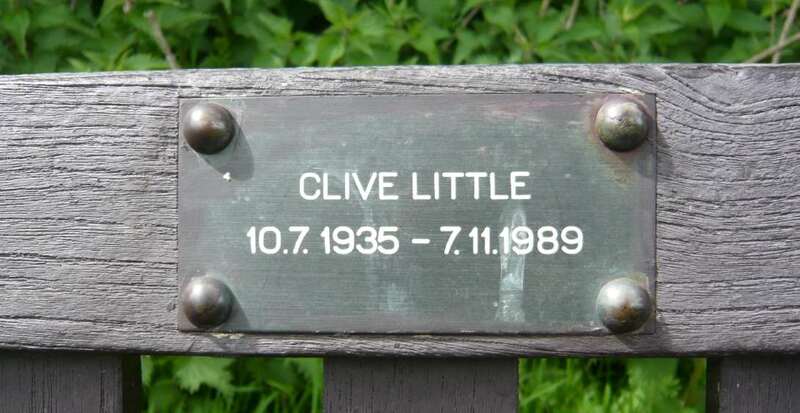 The latter also has the Clive Little plaque attached as it is a replacement for the old seat dedicated to him which was moved and damaged - see below. 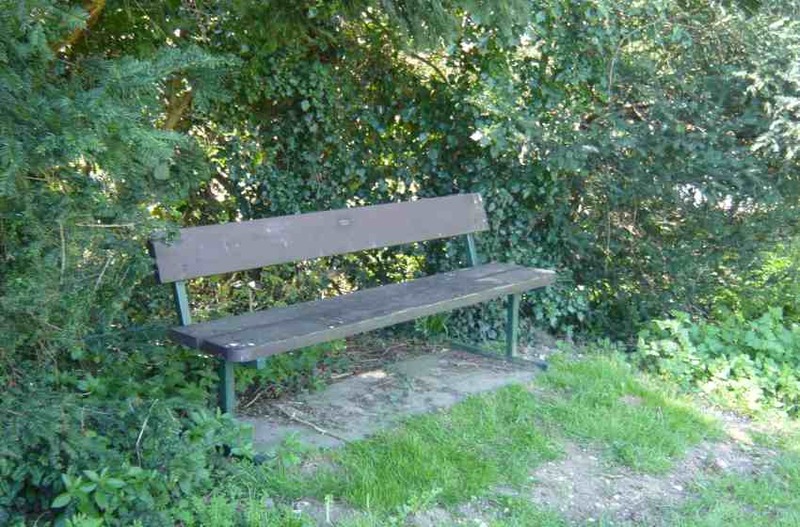 The two benches in Green Hill (Field 1) dedicated to Miss Margaret Horn are probably the oldest dedicated benches in Selsdon Wood. One is at the top south eastern corner (top photos) and the other at the bottom of the field by the car park (bottom photos). The name is misspelled on the plaques (see the tribute below) and should be Horne. In 2015 We were contacted by two nieces of Margaret Horne - Jenny Wheatley and Carole Horne who supplied the following tribute. 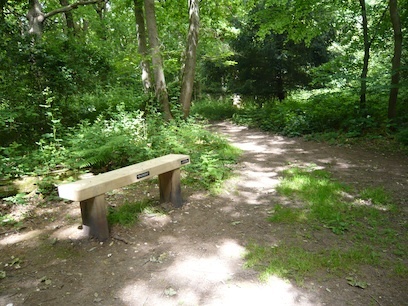 The benches in Selsdon Wood (or The Bird Sanctuary, as we always knew it) are dedicated to my Aunt, Margaret Horne (unfortunately her surname was wasn't spelt correctly on the plaques - I don't know why it was never corrected!). 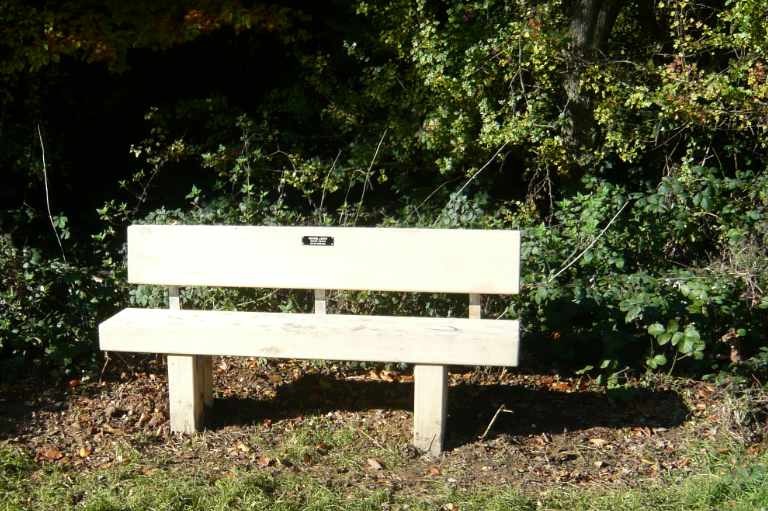 The benches were instated by my father Peter Horne (Margaret's brother) and her family as the wood was much loved and much frequented by all the Horne family over three generations. Auntie Margaret never married. She lived at the bottom of Farleigh Road with my grandparents and cared for them before she herself died at the premature age of 55 on 30th July 1975. The family moved to Selsdon around the 1930's, but have now all moved away. Margaret was a lovely lady, who died far too young and I have many happy memories of the fun we had having picnics in the wood. We do not know whether Murray Silverstone and Marjorie Howard knew one another in life but their tribute benches are shackled together on the north-east side of Field 2. Please get in touch if you can tell us anything about either of them. This bench dedicated to G G Lewis was installed in the Great Field by the FSW in the spring of 2015. 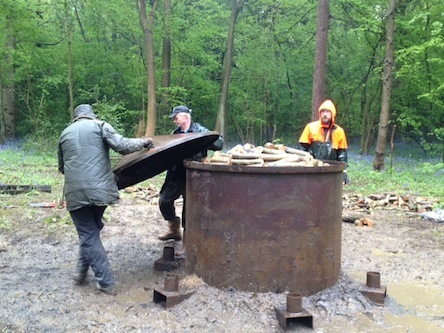 It was funded by friends and family of Mr Lewis who died the previous year and had enjoyed walking in the wood with his dog. The following tribute is by his daughter Anna Lewis. Geoffrey Lewis was born in Sidcup on November 5th 1944. Educated at Chislehurst and Sidcup Grammar School, he was the first member of his family to go to University and one of the first intake of students at the University of East Anglia where he was awarded a degree in English Literature. However his first love was Drama and the theatre and after a year teaching at John Ruskin Grammar School in Shirley he won a scholarship to the Royal Academy of Dramatic Art. 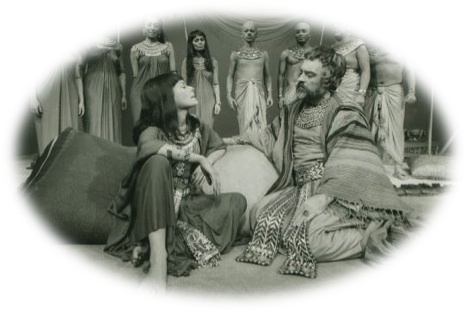 He graduated from RADA in 1971 and after serving his apprenticeship in repertory theatres around the country and working for the BBC, he joined the Royal Shakespeare Company at Stratford. He then returned to London theatre but became increasingly disillusioned with theatrical life and decided to return to teaching. In 1975 he rejoined the staff of the then John Ruskin High School in Shirley. In 1977 he married Jeanne, a fellow teacher, with whom he had two children, Anna and Oliver. In 1983 became head of English at Shirley High School where he remained until his retirement in 2009. Geoff was a kind and caring man who loved his family and his dogs. His passion and hobby was listening to classical music and he amassed a considerable collection of recorded music, attended concerts in London whenever he could and was a faithful committee member of West Wickham Recorded Music Society. He loved travel, particularly Italy and all things Italian and continued to enjoy and keep abreast of developments in the theatre. He also enjoyed walking, both in the local countryside and abroad. 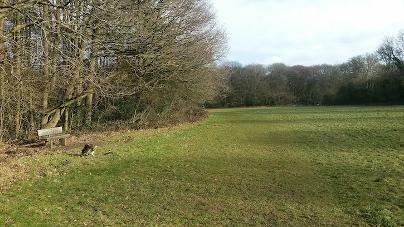 He regularly walked his dogs in Selsdon Woods and never failed to comment on how much he loved being there. Sadly Geoff was diagnosed with Alzheimer’s disease and Vascular dementia in 2013 and died very suddenly of a heart attack in February 2014. We don’t feel we had long enough to say goodbye to him and miss him desperately but we know he loved these woods and are glad that his memory is preserved here. 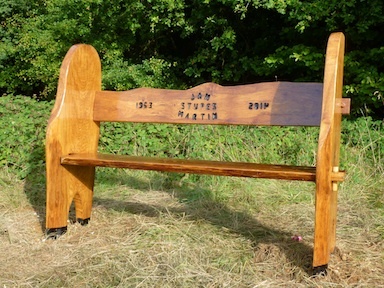 This seat dedicated to Clive Little was originally in the Great Field with its back to Steven's Larch. This seat was moved by vandals into Steven's Larch and damaged in 2017. 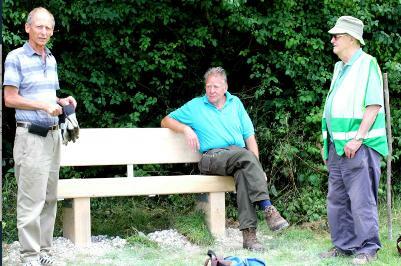 The FSW replaced it in 2018 with a new seat further along Great Field backing Steven's Larch and moved the plaque to the new seat. 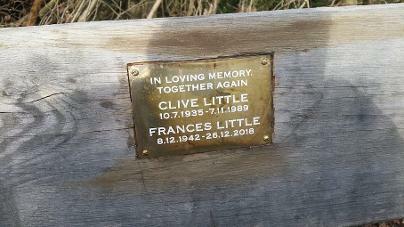 On The death of Clive's wife in 2018 the family contacted us to ask if they could place a new plaque to commemorate both of them - see photos below. The original plaques were moved to the back of the seat. Clive lived adjacent to the bird sanctuary for many years on Cascades, Forestdale. He met Francis in 1984 and they lived together till he sadly died in a car accident in November 1989. Francis remained at the same address and continued to enjoy the woods until her death in December 2018. This seat was built and installed by friends and family on 22/8/15. We have no further information about Jan. 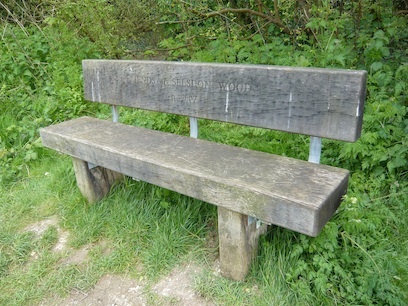 These two seats in Great Field backing the Centenary Plantation were presented by the Croydon Centre National Trust in 1983 and both have the same inscription. They are excellently placed as the one lower down the hill is in sunshine and the upper one in giving a suitable sitting place whatever the weather. By 2017 the seats had started to rot and one became unusable. The FSW approached the NT to ask if they would fund a replacement which they agreed to do. 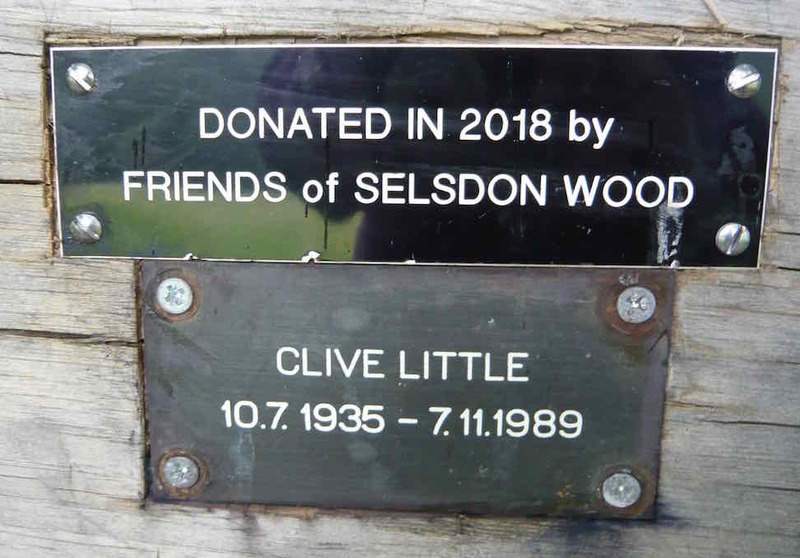 The seat higher up the hill was replaced in May 2018 with a new sturdy seat bearing an inscribed plaque - see the photos below taken on 15/5/18.. This seat dedicated to Nicki is close to the southernmost corner of David's Crook. 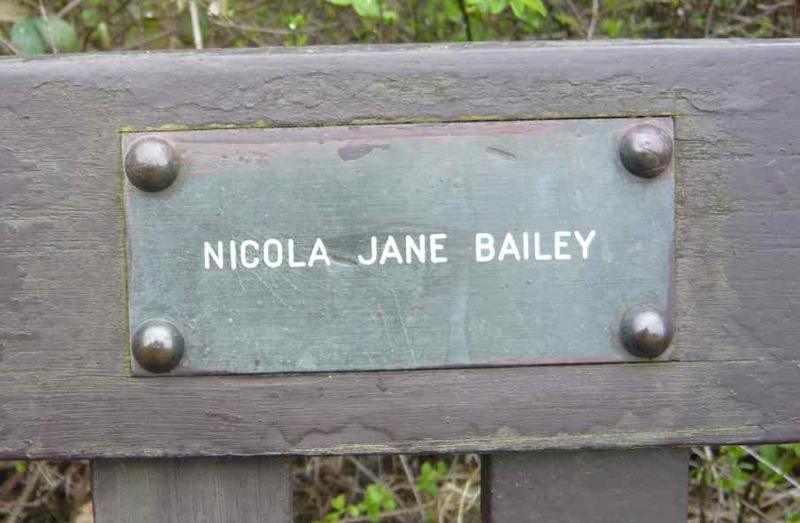 No surname is given and we know nothing about Nicki or when the bench was placed here. Please get in touch if you can supply any information. This seat, dedicated to Enid Parker was donated by her family and installed by FSW in May 2018. 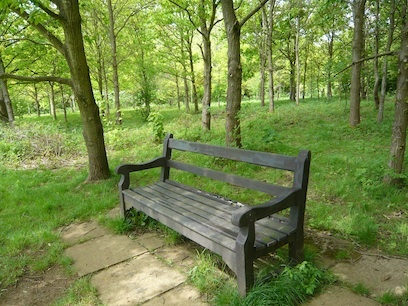 It is located at the top of Great Hill (Field 3) and is a lovely cool place to rest on a hot day. Our Mother, Enid Parker, lived in the Selsdon area for over 50 years. She was born Enid Maud Turner, in Kingston upon Thames, on December 29th, 1934. Her mother passed away when Enid was five, and she spent her childhood moving between family in north and south London. Her marital home in Dulverton Road in Selsdon was her first settled home. She moved there with her husband Ken in 1960, and it was there they began to raise their two children, Stephen and Jane. Fond memories were formed of a Selsdon of old - families would run into friends on Addington Road as they shopped at Sainsburys, Dewhurst, the Co-op and Woolworths. The Village Club was a fixture then, as it still is now. Children played all over, cycling to Littleheath Woods and Selsdon Recreation Ground (the rec). Enid's family moved to Greville Avenue, right next to the rec, in 1974, and her kitchen had views over looking the Bird Sanctuary. 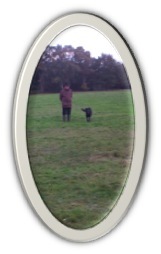 She and Ken enjoyed walking in the Bird Sanctuary (now Selsdon Wood), and also ventured further afield to walk parts of the London Loop and the Pennine Way. In the mid 1980s, Enid and Ken moved to Sanderstead, but they would continue to shop and socialise in Selsdon for the following three decades. Enid spent most of her working career at Croydon School of Art, 25 years in all, starting as a secretary and rising to the position of School Registrar. 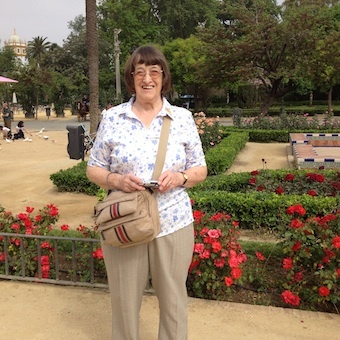 With retirement came the opportunity to travel, and she and Ken embarked on cruises and adventures across the globe – highlights included travelling down the Amazon River, and meeting her sister's family in Australia. She also enjoyed spending time with her grandchildren – three of whom live in New York, and two in Dublin. From 2012, she dedicated herself to caring for Ken as his Alzheimer’s Disease slowly progressed. She also continued to involve herself in the Bowls club in which she had been active for twenty years. Enid leaves behind a husband, son, daughter, son-in-law, and five grandchildren. 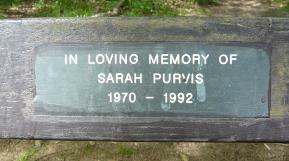 The seat dedicated to Sarah Purvis is beneath one of the loveliest trees in the wood - a great Oak on the Steven's Larch side of the Great Field. The tribute and photograph below were supplied in 2015 by Sarah's parents, George and Valerie Purvis in response to our request for information about her. Sarah Purvis was the youngest daughter of George and Valerie Purvis. As a family we moved to Selsdon, when Sarah was 3 years old in 1973. Our house was on the new Wimpy development with a beautiful view of Selsdon Wood which we soon explored and loved. Sarah attended the playgroup which was in Dulverton Road and then moved to the old Selsdon Hall based at the far end of the then car park. From here she transferred first to Gilbert Scott infant school and then to the junior school. We spent many happy hours in Selsdon Wood during this time of her life. She often went there for picnics in the top field with her Grandma, sister and cousins where they played forty-forty (hide and seek) in the surrounding trees. During her primary years Sarah began to learn to play the piano and clarinet She became a Brownie of the 1st. Addington pack and followed on to become a Guide. She had horse riding lessons and enjoyed walking a friends’ dog in Selsdon Wood. She liked to cycle along the lower path to her Grandma's house on Forestdale. Her favourite activity on snowy days was to go tobogganing in Selsdon Woods using a tea tray. Sarah enjoyed the fun things of life, school was something she had to do. We moved to our present house in 1980 and at 11 years of age Sarah transferred to Monks Hill High School, now The Quest Academy. She joined the school orchestra as a member of the clarinet section. She learnt to pl ay the percussion instruments and played in The Croydon Schools Orchestra percussion section. She enjoyed cookery lessons and was becoming a good cook. She learnt to speak both French and German. She achieved 5 O Levels. At 16 years of age Sarah went to Carshalton College where she studied for a two year B Tec. Diploma in Travel & Tourism. 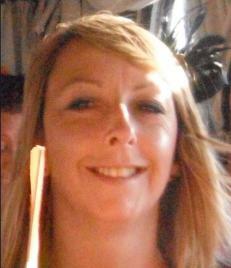 This led to her working in the travel industry and she very much enjoyed the opportunities for travel it afforded her. Sarah was always at her happiest when she was free to do what she wanted. She was a lively individual, with a good imagination and she was always kind and helpful. The older she became the more restricted she felt, she found it difficult to adhere to the constraints being an adult put on her and she ended her life at 21 years of age. We chose to remember Sarah in Selsdon Wood because it was a place she had always known, a place of happy memories and a place of peace and beauty. It is easily accessible and we see the changing colours and the lovely view everyday from our house. In the July 2016 the seat was moved by vandals and broken in the process. FSW looked at it and decided that it was beyond our capabilities to repair as much of the wood seemed rotten. We asked Croydon Council to take a look at it and they removed it from the site for inspection. They too decided that it was beyond repair and offered to replace it with a different refurbished seat and to reset the old plaque in the new seat. The replacement seat was set in place on 24th October 2016 when this photo was taken. The original plaque has been set in the back (see above). 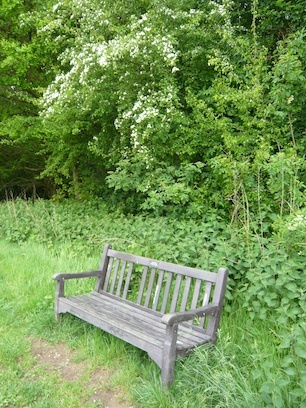 This bench, shown in Winter backed with ivy covered trees, is in the Great Field backing Steven's Walk. This tribute was written by his daughter-in-law. My father-in-law Eric Charles Saines was born 24 June 1901 in Frith Road, Croydon; he was the son of Charles Saines, who was at one time the Croydon Town Police Sergeant and his mother, Annie Margaret Saines was one of the victims of the Croydon Typhoid Outbreak in 1937. He married Elsie Rivers in 1933 at Christ Church, Sumner Road, Croydon, and they started married life in Sundridge Road (now Greville Avenue) Selsdon, later moving to Birdwood Close in 1941, then in 1977 to Ashen Vale; where he lived until he died in July 1987. Eric worked as an Insurance Clerk for the North British Insurance Company in Croydon; during World War II he was part of the Selsdon Home Guard; he was a founder member and one of the first Chairmen of the Selsdon Village Club, when it was originally based over Bailey’s Garage. He loved gardening and had an allotment, on the area where Sainsburys now stands, and he also loved cycling; regularly going for long cycle rides around the Kent and Surrey countryside. He and Elsie had two sons – Michael and Martyn and three grandchildren. Both he and Elsie loved to walk in “the Bird Sanctuary”, as it was then known by everyone; every day, without fail, they would walk there with the various dogs they owned over the years. They both loved the Bird Sanctuary very much, which they could also see from their home in Birdwood Close. Eric died in Croydon General Hospital on 11 July 1987; Elsie, who continued her daily walks in the Bird Sanctuary, died in February 1992. The photos below show Eric with the Selsdon Home Guard. Elsie said the marching group were in Katharine Street - however it doesn't look like Katharine Street - more the lower half of George Street or North End (near Allders). Eric can be seen third from left - behind the second man saluting. All are looking very smart with knife-edge creases in their trousers. 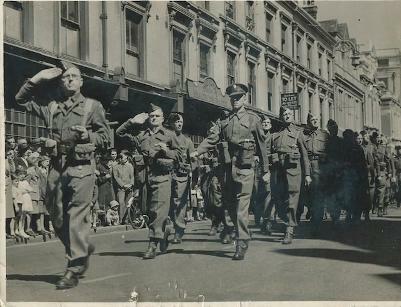 The parade may have been around VE day. In the second photo Eric is seated third from right. The Home Guard headquarters was in one of two old houses that used to stand in the Addington Road - one was on the site where Aldi is now and the other is where the Aldi car park and what was The Good Neighbour (The Stag) pub stood. One of these houses was used for the Selsdon Boys' Club and the other for the Home Guard. The two houses were pulled down in about the early 1950s, We kids used to hurry by them as they were very dark and derelict and everyone said that witches lived in them and would grab you when you went by - so we used to run very fast as you can imagine. When my in-laws moved to Selsdon in 1933 Elsie thought it would be a good place to go as there were no pubs in the village. 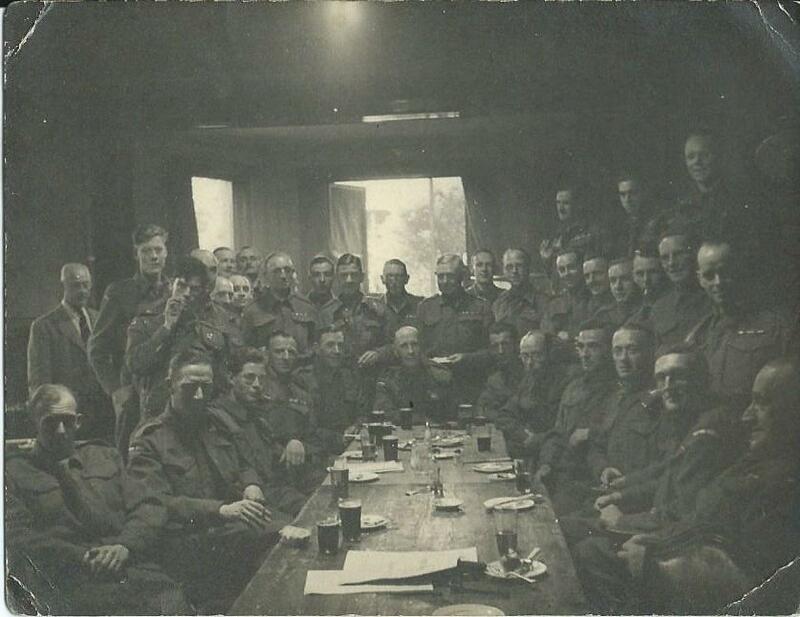 However, when Eric joined the Home Guard they set up their own bar in the Home Guard house (see all the beer on the table). This was the forerunner of the Village Club, which was set up over Bailey's Garage eventually. Hence the reason Eric was a founder member of the Village Club! Mind you to thwart Elsie, Eric did cycle or walk down to the Cricketers in Addington Village or The Harrow at Farleigh on a Sunday or a summer evening - never a man to miss out on his beer!! 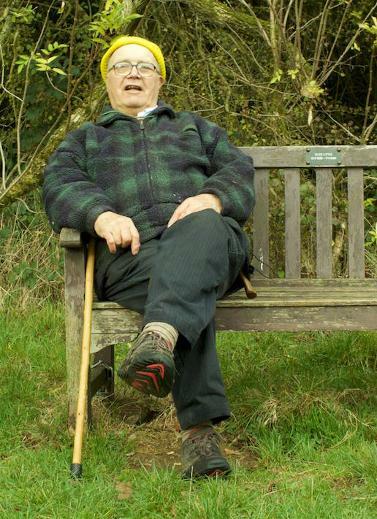 We are very sad to report that a well-known visitor to Selsdon Wood, Ron Smith, died in the summer of 2017. 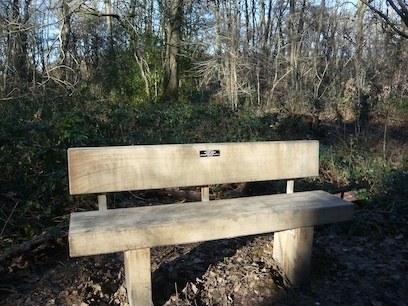 A seat dedicated to him was placed in David's Crook in May 2018. 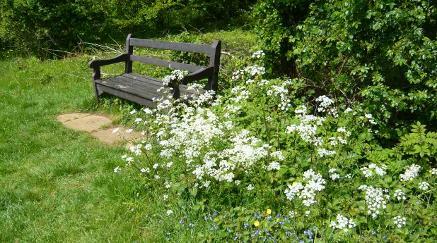 The seat is surrounded by Hawthorn, which looks and smells lovely at this time of year - see photo below. Ronald Smith was known to many as the man who lived opposite the main gate in the red brick house that he built. He started building his house in 1955, just after the war. Materials were still rationed, therefore it took him 8 years to complete the property. During his time living opposite the Selsdon Wood (The Bird Sanctuary as we knew it) he watched the small holdings around be demolished and Ashen Vale, Selsdon Vale and Kersey Drive be built. 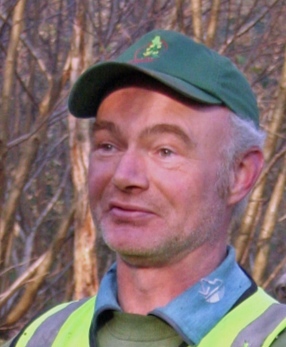 Many people would recognise him with his bright yellow hat and sash which he wore for visibility after a report of an old man being snared in the woods for three days. He also carried a whistle to call for help. Before retirement he was a metal and woodwork teacher in Brixton, working with children with learning difficulties. He will be missed by his 4 children, 7 grandchildren and 2 great grandchildren. 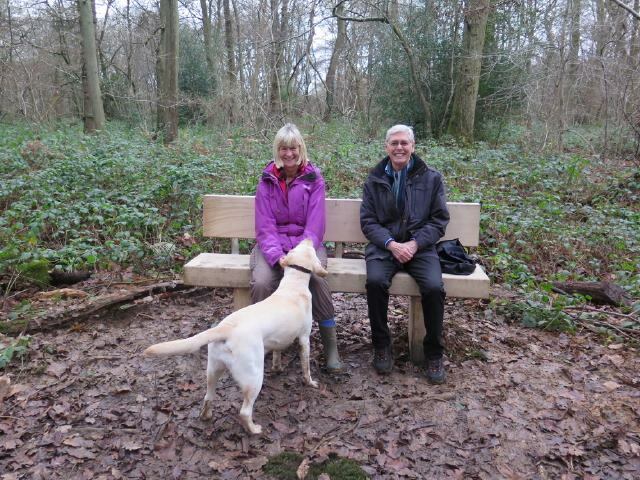 The photos below shows the bench in May 2018, the dedication plaque, Ron in his characteristic yellow hat (thanks to Andy Hart for this) and in our wood at bluebell time (thanks to his son Garreth). 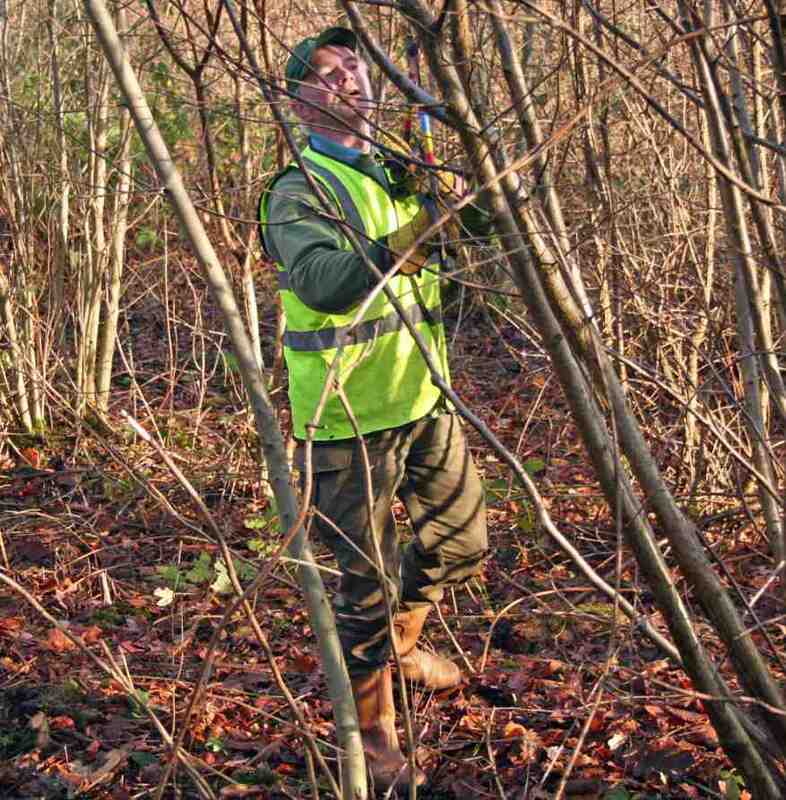 Rob Sowter was the woodsman who created and maintained the strip of coppice running along the eastern side of The Wend. 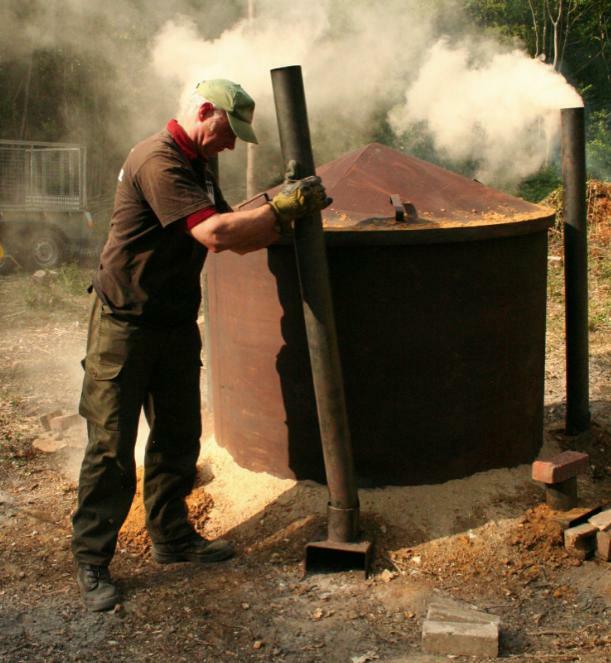 He was well known to the Friends who saw him regularly and he also worked with us to run a couple of charcoal burns in 2011 and 2013, and he taught us all we know about charcoal making and coppicing. 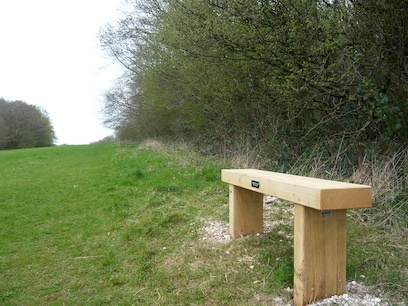 Rob sadly died of cancer in 2014 and in spring 2015, with the blessing of Rob's brother, the FSW installed a tribute bench at the corner of The Wend and Noakes Way facing the last section of coppice that he had worked on the previous autumn. We shall sit there to watch the birds, enjoy the tranquillity and remember him. Thanks to David, Ted and Neale for the photos. 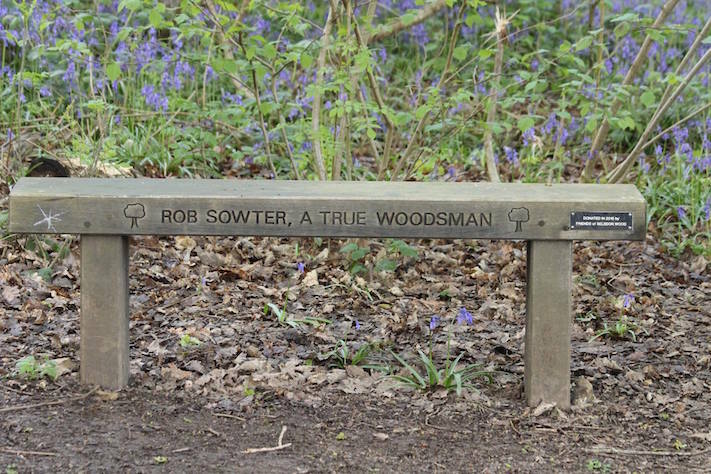 "One of the wooden bench dedicated to a good friend and as mentioned true woodsman Rob Sowter."